To survive chronic sexual betrayal, one of the most important skills you must learn is effective boundary work. Getting clarity about your needs and wants, and knowing how to get them met. Creating space for you to feel safer, more peaceful, and joyful. Knowing how to make a request of another person to get a relationship need met. Getting to resolution more quickly, and avoiding wasting time playing games or being strung along by people who have no capacity or intention to create a meaningful, intimate relationship with you. Discovering whether someone is capable of being reliable and accountable—thereby earning their place in your life. Most people—not just betrayed partners—are painfully uninformed about how boundaries work. And that was one of my primary inspirations for writing Moving Beyond Betrayal. This is by far the most common mistake partners make. 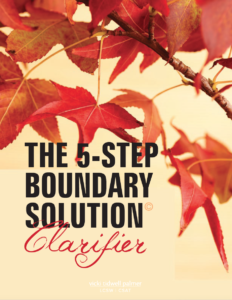 Before the 5-Step Boundary Solution process presented in Moving Beyond Betrayal was widely available to betrayed partners, they were often told to “make a list of boundaries” and tell their unfaithful spouse what their boundaries were. “You,” of course, refers to the unfaithful spouse. Of course, you could establish a non-negotiable boundary for yourself—meaning if your unfaithful spouse chooses to be sexual with another person, you will separate or leave the relationship. However, saying that someone else must do something because “it’s your boundary,” doesn’t make it so. Looking at the boundary list above, you can either establish a non-negotiable boundary (for being sexual with another person, for example), or you can make a request for the purpose of creating an agreement. When you want to create an agreement with another person, the other person must agree to do—or not do—something. An agreement between two people is a contract, and when a contract or agreement is broken, that is a boundary violation. The bottom line is that when it comes to boundaries, you can tell another person what YOU will do (or not do) if a particular event or action occurs, but no adult can tell another adult what they will or won’t do. The second most common mistake betrayed partners make when setting boundaries is that they often give up or say that a boundary “didn’t work” if an agreement was broken or a boundary was violated. There can be many reasons why an agreement or boundary doesn’t work, but it rarely means there are no other steps you can take. Often, a clearer or better agreement will fix the problem. Or you may need to increase your level of self-care (boundary work) based on the boundary violation. For example, you may need to protect yourself physically, sexually, or financially due to a broken boundary. Or you may need to put a system of accountability or other safeguards in place to protect you from future boundary violations. Regardless of how or why a boundary doesn’t work, there is almost always something more to be done, even it means you must accept powerlessness over other people, places, or things. When you understand how boundaries work, you will know what to do next. The third most common mistake betrayed partners make when setting boundaries is that they issue threats, ultimatums, and demands. The first problem with ultimatums and demands is that they never work in the long run. They may get short-term results due to their threatening or even hostile delivery, but they are no substitute for effective boundary work. The other problem with ultimatums and threats is that the person who states them often doesn’t follow through. When demands and ultimatums are made, the person making them is almost always in a highly activated or angry frame of mind. Because of the level of intense emotion involved, lack of follow through is a common consequence. For example, a betrayed partner may tell her unfaithful spouse that if he has a slip she will leave. But she doesn’t. Unfortunately, when this happens the partner becomes untrustworthy to herself, and loses credibility with her spouse. The solution is to get clear on your non-negotiable boundaries and understand the difference between non-negotiables and important relationship needs. I don’t recommend that you tell your spouse in advance what you will do should a certain agreement or boundary be violated (except for non-negotiables that you are 100% clear about). While you might feel more powerful stating your consequence, there are a couple of problems with stating them in advance. The first is that if/when the event occurs, you may not want to do what you had originally thought you would, or you may not follow through at all. It’s much better to have the mindset that you will know what to do if/when the time comes. Hi Darlene! You’re officially signed up and should receive the blogs via email moving forward. Have a wonderful day! Boundaries are SO important, especially when there has been a betrayal. Great bite-sized tips to be mindful of, and your book is a wonderful resource that delves into this topic! I’ve had so many betrayed partners share with me that they wanted to recommend Moving Beyond Betrayal to a friend or family member (for the boundaries information) but can’t because of what sharing the book would disclose about their situation, that I’ve decided to start a podcast on boundaries for the general publi that will launch next week: Beyond Bitchy: Mastering the Art of Boundaries. If you or your clients want to take a listen, you can subscribe on iTunes/Apple Podcasts here or for Android here. Vicki, I just realized I never replied to this. Thank you for letting me know about your podcast. Looking forward to listening and sharing. I love the title! I completed the form to subscribe to blog several days ago, but have not been receiving it (it’s not in my junk folder). Please subscribe me. Thank you. You have subscribed and should be getting notifications of new blog articles.